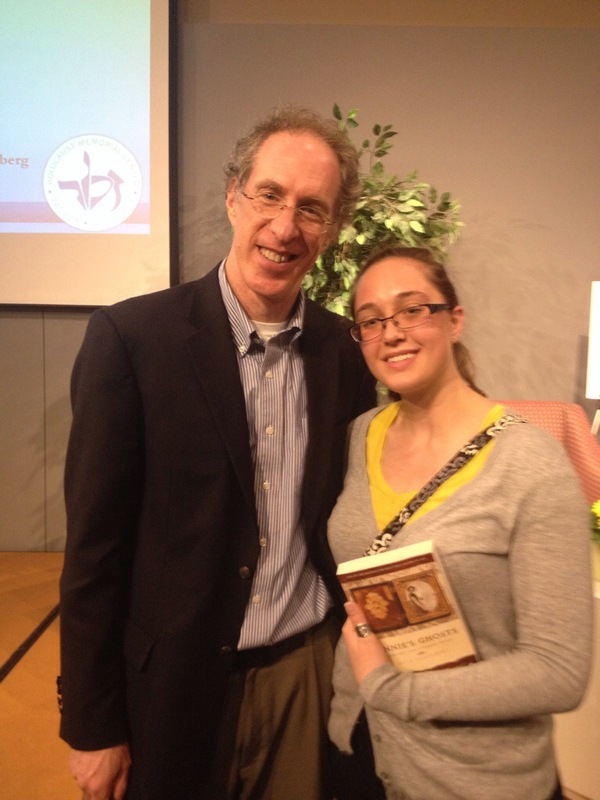 You might not have heard of author Steve Luxenberg if you haven’t been following me long, but for me, meeting him was kind of a big deal. Steve is the author of Annie’s Ghosts, a book I read for two different book clubs which gives you the chance to look at my book review and both book club reflections. So yeah, I was excited. The event was an embarrassingly long time ago (March 21) and I’m sorry that I’m only getting this posted now. This draft has been sitting in my folder for much too long. There was a moderator who was part of the Action Reconciliation Service for Peace organization; a group that grew out of Germany after World War II which sends youth abroad to work for understanding and peace as a result of Nazi actions during the war. The panel consisted of Steve Luxenberg (Washington Post) and Dana Nemeth, Director of the Wood Co. Historical Center and Museum in Bowling Green, OH. Dana was selected because of her work with the asylum in her county. It’s interesting to me how different it is to see a fiction writer versus a non-fiction writer. A fiction writer talks about process and inspiration whereas a non-fiction writer talks about their topic even further and maybe touches on how they do their research. A lot of this post will reflect Steve’s research and ideas. Steve says that his book is ultimately about identity. He felt that Beth lost her identity by denying her sister for so long, Annie carries her identity as a physical deformity with her at all times, and that he gained an identity through his research into his family. I can see this as a theme and I think it’s interesting that in a book I perceived as being about mental illness and family, Steve saw something more universal in his writing. That showed me that no matter what you think a book is about, the author might think something completely different. His perception might be different because it deals with his own family so directly. Steve talked about how writing about your own family and friends can be challenging because you’re presenting this person to your readers in a manner in which they can be judged. What if the readers don’t like your family? There was one woman in the audience who really didn’t like Steve’s mother and said so. I think this would be hard for me to deal with, but Steve took it in stride. He told me later that, “All readers are right.” So the woman who disliked Beth, and another who thought she was strong are both right. We as writers just have to choose who we’ll listen to and make sure to bring the scene to life as much as possible. Steve recommends remembering to bring the five senses into each scene to give the reader an experience. Anna Oliwek is a distant cousin of Steve who he found living in Michigan. Anna is actually in the Portraits of Honor gallery for Michigan Holocaust Survivors so you can check out her profile. Her son, David, attended the event and Steve recognized him, thanking him for coming and thanking his mother for helping him so much in his research. It was really cool. The Portraits of Honor memorial is one of many that are active to this day. Another that was mentioned was the Shoah Foundation, which has visual memories of the Holocaust such as video and photos. It was mentioned that Steven Spielberg is active in this memorial. The host location for the event was the Holocaust Memorial Center and they strive to bring in speakers and events like this, Steve, and many others, to continue remembering those who lost themselves to the Holocaust. Returning to mental illness, it was brought up that a small film is in the making that will focus on Eloise and what happened to those that lived there. The film is supposed to be filming currently in the actual location in Westland, MI. You can read more about it here. Steve gave me my favorite advice; “Read.” When you read, recognize when something works and think to yourself, “Why?” When something doesn’t work, ask yourself the same question. By knowing what does and doesn’t work in books you read, you’ll know what will and won’t work in your own writing. I try to do this in my book reviews, giving a few points about what I thought was unique about the book or why the style wasn’t my favorite. I hope those help you all as well. I’m really getting bad about these Book Club Discussions and getting them up on time. To the lovely people in my group, I apologize. There are just not enough days in the week now that I’ve stopped blogging on Fridays. Well, kind of stopped (as you can see). We met on June 9th to discuss The City and the City by China Mieville. You can read my review of the book here. This meeting was delayed a month so this will be a shorter discussion as many of us forgot the details. We focused instead on overall themes and characters (which is my favorite, anyway!). Many of us were not fans of the book. We thought it was hard to get into and some people didn’t understand the concept of the cities at the beginning. I overheard a librarian describing the book to someone before I started it so I went into the book with an advantage not everyone had. We were very curious why the cities had split. Had they started very close to each other and fought for space? (Side note, this reminds me of games such as ‘Slay’ and ‘Civilizations.’) Or were they once one city that divided due to some political issue? We wished there had been a bit more information on this. To a reader, the cultural divide seemed arbitrary and reminded some of us of the divide in Rwanda. There’s a scene in the movie Hotel Rwanda where it is illustrated how little an outsider can see the difference in their cultural groups, even though it seems obvious from the inside. We felt like the Ul Qoma and Beszel divide was similar. Many of us liked (or at least noticed) that the people in this book had to develop some words that existed only to them because of their living situation. ‘Toppleganger’ was a favorite. This made me think about how every group creates their own words based on need. We all know the example that Eskimos have fifteen words for snow based on the size of the flakes and intensity of the storm; I see this as being along the same line. The cities themselves play such a large part in the story that they’re characters themselves. Some members of our group argued that they’re bigger characters than the people because the people were a bit under developed much of the time. They dictated the actions Borlu and his counterparts took more than another single character. One of our discussion questions was about the choice of Borlu as a narrator. Our answer depended on what we thought the novel was about. Some of us thought of it as a mystery novel (myself included) and in that case, yes, Borlu is a good narrator. But some of the group thought the book was a social commentary and in that case, the archeologist, David Bowden, might have been a better choice because he was more attune to the social issues between the two cities. I think it’s safe to say that there was social commentary wrapped into this crime novel and I think Borlu was a logical choice for a narrator because Mieville explored the crime aspect more than the social commentary. There was a part in the book where Borlu talks about a conference he went to for divided areas and he felt it was an insult for someone to compare the Ul Qoma and Beszel situation with Israel and Palestine. However, it made all of us think of the Israel/Palestine problem! The biggest difference was that Ul Qoma/Beszel was much less violent. The two groups existed besides each other and didn’t seem to be fighting for space like in other situations. We felt that Breach was the main reason the two groups were at peace with each other. It was hard for them to go to war or even be angered by someone in the other city with Breach being so vigilant and watching the people all the time. China Mieville is an active member of the Socialist party and we wondered if that influenced this work. I’ve seen in my Google searches that some of his other books lend themselves to socialism, but I didn’t see a lot of socialist themes in this book. The economies of the cities were not a focus of the novel, but I don’t remember either of them striking me as socialist. It’s an interesting thing to note, but I don’t see it as influential on this work. One of our members pointed out the prejudice in the book. I had noticed Borlu’s comparisons of the two cities and that he seemed biased toward his own city, but I didn’t find that unusual. I think people tend to think their cities are better than others. However, once I started thinking about it, it seemed more like a rivalry between two schools than city pride. Borlu thought his city was working harder, had a better future, etc. We wondered how they could form an opinion of Ul Qoma if they didn’t see it. Wasn’t having this opinion an admission of breach? It seemed like it was unusual for people to cross the border the way Borlu did. How would they have formed these opinions? It seemed that they couldn’t completely unsee everything from the way Borlu described life in the city. Maybe having to unsee something makes you think that you’re better than it. We took unseeing the other city as a metaphor for how we look past things we see in our own cities. For example, when I worked in Washington DC, I’d walk past homeless people like I didn’t see them. Of course I did see them, but I chose not to recognize them. If you’ve never lived in or traveled to a big city before, maybe you think I’m a jerk for saying this, but when I go into Detroit or on my recent trip to Chicago, it was hard to avoid and too numerous to help everyone. It helped me understand that we all unsee one thing or another. We talked about other things we unsee in our lives. In our own homes, we look past something that’s dirty that we don’t have time to clean, or a chore we’ve been putting off. Outside, we’ll look past litter and maybe ignore abandoned buildings with busted windows. We can try to look past our neighbor’s dead grass or terrible choice of landscaping. At work, we can pretend we don’t see what Sally May has a new skirt that is too short or that Billy Joe has on tennis shoes instead of dress shoes. It’s not our place. Personally, I try to unhear my neighbor’s children throwing a ball against the wall or playing in the foyer until 10 PM. There’s something we all unsee. This was a great group despite many of us having forgotten a lot of the book. We’ll meet again in August to discuss A Hologram for the King by Dave Eggers which I’ve started and so far absolutely love. Hello again, all! 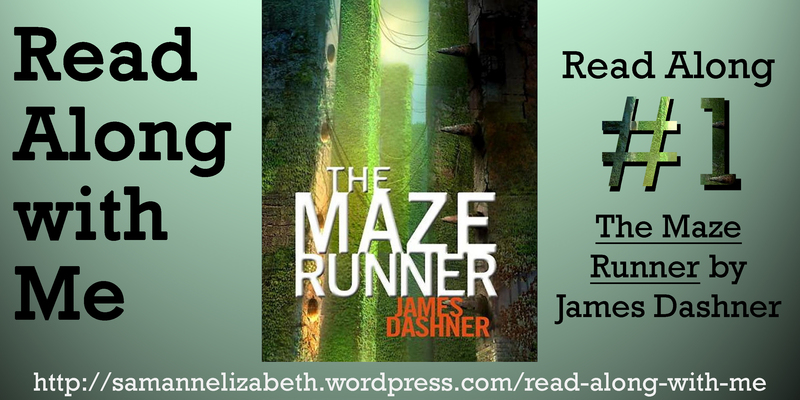 We’re getting close to the end of The Maze Runner and we’re finally getting some answers. Thank God! If you haven’t read the book before, know that this will likely ruin it for you. Sorry. Question from Barb: On page 200 the Gladers ponder that the sun has “disappeared”. Thomas understands that there never was a sun and “Everything about this place was fake.” All I could think of was the movie The Truman Show when Jim Carey sails to the edge of his world. The Truman Show was reality TV taken to extremes. Do you think this situation in the Glade is just for some demented group’s pleasure? I sure hope not! I had flashbacks to The Truman Show as well when I read that part of the book. It doesn’t seem like a Hunger Games twister pleasure game to me, especially in light of the words Thomas found on the wall of the maze. It could still be the case, but I think we’re chasing a more Divergent-like plot than anything right now. We’ll see how this goes. Also from Barb: The signs in the maze that declare it part of the Killzone Experiment Department seem so ominous yet Minho dismisses them. What obvious signs of disaster do we dismiss in our lives? Al Gore’s “Inconvenient Truth” and Rachel Carson’s “Silent Spring” are some classic examples. I think there are a lot of things we walk past and dismiss which should actually scare the pants off of us. The rising cost of gasoline; consistently bad weather patterns; rising water levels, high pollution levels; I could go on for a while. I wrote a post (which you will see tomorrow) about how we ignore a lot of little things in our lives like piles of laundry, loud neighbors, or a co-worker’s inappropriate clothes. It’s almost too easy to look past these things. Question from Nicole: When they come to the writing in the maze that says, “World in Catastrophe,” I think of it as a message from the others to the boys about the previous world they lived in. What else could this mean? Why do you think it’s written on the walls in the maze? Do you think that it’s a message about the Maze rather than about their previous world? Hm, I hadn’t considered that. Maybe ‘World in Catastrophe’ is the name of the Maze experiment (I still think it’s an experiment). I hope their future world isn’t falling apart! Question from Sultana: How do you feel about the book overall so far? What do you enjoy, and what do you think could’ve been improved? Feel free to elaborate on anything, possibly including plot, character development, writing style, setting, etcetera. Question from Ashlee: It’s evident now that this is an experiment of some kind, so why do you think the Creators choose teenagers as their subjects instead of adults? Are there benefits to this? Question from Katherine: Alby runs off in the middle of the night to look at the maps. When he was going through the Changing, he said “Protect the maps”… but he also tried to strangle himself. Clearly there were warring forces at work in his mind. I can’t help but think his weird dash into the night means that he’s going to destroy the maps, not study them…but would that be Alby-Alby at work? Or Creator-controlled/changed- Alby? In other words, whose agenda is whose? If we’re going off the assumption that he’s going out to destroy them, I would think that’s Creator-Alby. I can’t see a reason Alby would think the Griever would want their map information. The Grievers don’t seem like intelligent beings who could steal information. I think at worse they would destroy the maps themselves. I guess Creator-Alby could destroy the maps and blame it on the Grievers, but I don’t think Alby-Alby would have a reason to do this. Question from Lynn: Do you have any more insight into what role Thomas and Theresa have in this experiment? I have a feeling they have some kind of decision making roll but I can’t put my finger on what I think it is. Maybe they chose the people to go into the maze or have some sort of say in what the Grievers do. Whatever it is, it seems that it’s something Gally’s not a fan of so I feel like they’ve contributed to something Gally considers to be suffering. Maybe the death of a friend or the pain of the Changing. As expected, not much to report for MizB’s WWW though I’ve been progressing nicely! Currently reading: I’ve slowed down just a bit onThe Orphan Master’s Son by Adam Johnson. It’s good, but not so gripping that I can’t put it down.. I’m at the final stopping point of The Maze Runner by James Dashner and I’ll remain there until after the 4th of July holiday so don’t expect any movement there. And please be a dear (unlike Nicole) and don’t tell me who dies at the end. On audiobook I started Fast Food Nation by Eric Schlosser but I’m still on the first disk. I guess I haven’t driven anywhere alone in a while. My carpool buddy and I are almost done with Brave New World by Aldous Huxley. Final disk! I’m getting close to finishing A Hologram for the King by Dave Eggers. It’s very unlike his other book that I’ve read but I’m really enjoying it so far! Recently finished: Nothing finished. This gives me a sad face because I’ve made so much progress with all of my books! I did review Brain on Fire by Susannah Cahalan which you can enjoy. Reading Next: I have The Coward by Kyle R Bullock next on my shelf. After that I’m going to seriously attack my When Are You Reading? Challenge and try to knock out the remaining time periods as fast as I can! I’m starting to get nervous on this one. I should have some progress to report next week! Possibly two books. What are your three Ws? Leave a comment and let me know and check out the original post on MizB’s blog! Meeting David Sedaris. A story of lines and chairs. I’ve never gone to meet someone before and known what their voice sounds like but not what they look like. It was a little strange. But ultimately awesome. Here’s my saga. The signing was 11 June in Ann Arbor, Michigan, which is about 40 minutes from home. Fortunately, I was visiting the Sunday before and stopped in the bookstore to ask what time general signing started. I knew the reading was at 5PM and I didn’t have tickets for that. They said it should start around 7, but to get there at 5. “Bring a chair and book,” one of the employees advised. Don’t mind if I do. So I went straight from work and got there just after five. I was fourth in line! Win. I settled in, thinking I’d sit there till seven and then get my book signed and be on with life. And by settled in, I want to specify that I bought and brought a folding lawn chair to sit in on the sidewalk. And I was the only one. So yeah, that was fun. About 6:30, people with ‘Waiting List’ tickets showed up. They’d gone to the story the day reading tickets were sold and didn’t get one so they got a ‘middle ground’ option of cutting in the signing line. My 4th in line was reduced to 20th. Dang. About the same time, it started raining so we were moved to the bottom floor of the bookstore to wait. David was still signing books from the people who attended the reading. He is so generous with his time that it created a Catch-22. He spent about five minutes with each person. So if you think about it, that would mean I should get to meet him about 8. However, there were the people from the reading as well and they pushed that out another hour, so I finally met David around 9PM after being in line for four hours. Yep. And remember, I’m toting a folding chair this whole time. He’s everything you’d think he would be: friendly, quirky, sarcastic, and random as hell. He had a box of chocolates that he was offering to everyone. I choose a coconut flavored one. I had two books for him to sign. The first was a copy of Dress Your Family in Corduroy and Denim that I found at a used book store. It’s a little beat up but the biggest problem was that it was already signed! It was bought at B&N that way by the original owner. So, David personalized it for me. 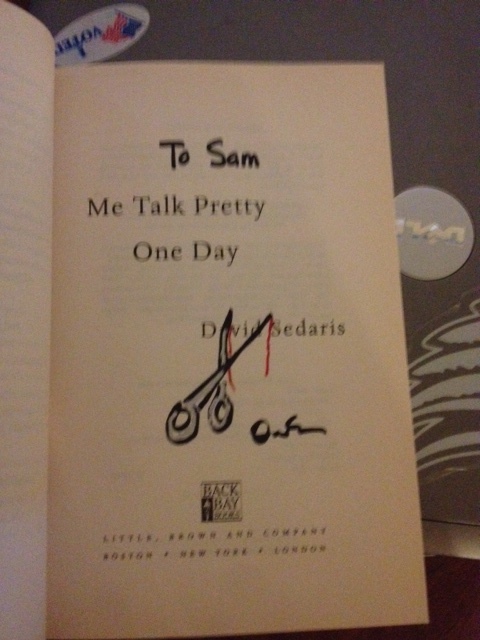 The other one was an (again) used copy of ‘Me Talk Pretty One Day,’ the only Sedaris book I’ve read so far. I wasn’t going to buy it, but it was in pristine condition so I’ll have a nice one to hang on to. He drew me a pretty picture. Because, of course, he carries a bag of multi-colored sharpies so he can draw bloody scissors in books. Why would you think anything differently? He said with a smile, “Write every day. Write on Christmas, write on your birthday, but write every day. And, of course, read.” I’ve heard this advice before but it was still great to have it reaffirmed. Writing every day is the reason I started this blog. Even if I’m not working on fiction, I’m working on my voice: my familiarity with words and commitment to style. It’s been a great practice. David said, “You might be okay now, but you’ll never be good unless you write every day.” And if you follow me here, you know I read every chance I can get. I love to take reading as a chance to develop myself as a writer. Unfortunately David doesn’t do pictures so I don’t have one to share. It was awesome to meet him and I want to publicly thank Katherine for waiting an hour and a half for me to get through the line so we could have dinner together. That was too kind of you. 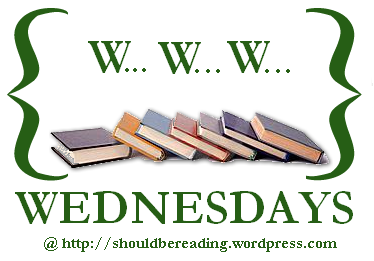 Book Review: Brain on Fire by Susannah Cahalan (4/5). A book that makes you afraid of the stranger coughing next to you. Yet another book club book that I enjoyed and never would have found otherwise. I love book clubs for this reason. It’s always scary for me to pick up non-fiction because I find it very hit or miss. For this book, TOTAL HIT. Susannah Cahalan was a successful New York reporter one day, and the next she was confused, having seizures, and paranoid. What happened? Cahalan takes the reader on her journey the way her family experienced it; one day at a time and one clue at a time. Having contracted a rare auto-immune disease that distorted her brain function, Cahalan’s journey is long and scary; the reader knowing it could happen to anyone, anywhere, at any time. I liked the way Cahalan structured this book. She make it a mystery for the reader as well, giving them only as much as she and her family had each step of the way. With each diagnosis, guess, and clue, she’s included the medical terminology and explanations she’s gained since regaining herself. She doesn’t have memory of so much of her time that a lot of her story is drawn from what her family and the doctors remember. It was so strange to hear about Cahalan’s behavior during her illness. The way she behaved changed so drastically from beginning to middle to end that it was almost a study in inconsistent characters. Knowing that a disease mysteriously contacted can do that to a person is alarming. Cahalan’s boyfriend, Stephen, was my favorite character. He was given an easy way to duck out when things got hard but instead he stuck with Susannah and her family. It would have been a quick and dirty way into a family, but he didn’t shy away and embraced it with full strength. I think that’s a trait all women look for in a man. Susannah’s parents reminded me of my dad. My mom went through a really terrible accident when I was young and my dad, much like the Cahalans, was at the hospital day and night, waiting for any news: good or bad. I could see him in them and the desperate hope they clung to. I enjoyed how Cahalan described her disease at the end of the book. She took case studies and notes from her doctor to paint a picture of others suffering from the disease, not just herself. It was interesting to see how the disease takes different forms and affects different individuals in different ways. I thought this was well researched and presented in a way that didn’t feel like a dry research paper. I didn’t like the parts where Cahalan narrated scenes that had been recorded during her illness. They were scenes of her waking in the middle of the night and having paranoid delusions of which she has no memory. They felt a little too much like ‘Paranormal Activity’ to me and took me out of the story. I wish she’d worked them more into her narrative as they stood apart a lot. Cahalan’s family was so dedicated to her health and I found that really inspiring. I liked that even when things looked terrible, they stuck with her and wouldn’t leave her side or give up hope that things could return to normal. Everything can get better. Writer’s Takeaway: Cahalan used a first person narration voice to cover a point of her life from which she has little memory. There’s no better example of blending memoir and autobiography that I can think of. It was researched, yet speculative at the same time and she blended it well. A good example of meshing styles. A well written story with a harrowing premise. 4 out of 5 stars. Like this review? Let me know on Goodreads! So it’s been a while since I wrote one of these posts. Over two months actually. And in that time I’ve added nine books to my shelf. And in the same time period, I’ve read 11. So, a net loss of 2 books per two months or one book per month. That means that at this pace, it will take me 112 months or 9 years and 4 months to clear out my shelf. Yikes. So with that sobering fact, I bring you a list of books I want to read badly enough to lengthen my list. Enjoy! Under the Wide and Starry Sky by Nancy Horan: I added this solely because a librarian said I might like it. I figured that’s a good enough reason. It’s a literary wives story, this time with Robert Louis Stevenson. The Diary of a Young Girl by Anne Frank: I think saying ‘I haven’t read this yet and I’m sorry’ should suffice. Misterio de La Guia de Ferrocarriles by Agatha Christie: A co-worker of mine visiting from Mexico gave this to me as a parting gift. It’s the Spanish translation of The A.B.C. Murders and I’m excited to read it! I haven’t read Christie before. The Namesake by Jhumpa Lahiri: I went to a massive used book sale called ‘Bookstock’ and this was one I couldn’t pass up. Lahiri has gotten a lot of attention lately for her books and I wanted to jump on the fan train. This book is about a family emigrating from India to America. A Widow for One Year by John Irving: Have I said enough yet about how I love John Irving? No? Well, I’ll say it again here. I adore him. I don’t even know what this book’s about and I don’t care. But I can bet there will be a life-long obsession with something, wrestling, bears, tragedy, and strange characters. And I’m excited. The Coward by Kyle R Bullock: Kyle was the first author to send me a request to read on my author’s page. So of course, I said yes. This trend will likely not continue in the future but Kyle is my lucky #1. The story is about a cowardly pilot during World War II. Miss Peregrine’s Home for Peculiar Children by Ransom Riggs: I’ve been hearing great things bout this one for ages. And this is available as an audiobook at my library so it was an easy decision to add. Winning. 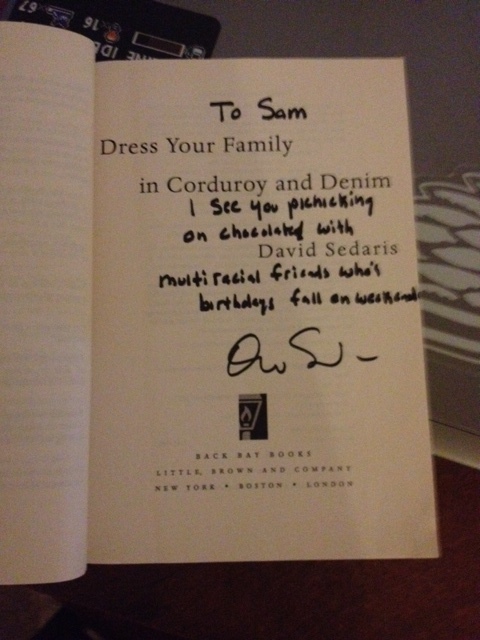 Dress Your Family in Corduroy and Denim by David Sedaris: I went to meet the author on 11 June and needed something for him to sign. I picked this up in a second-hand store and now it’s priceless to me! The Girls at the Kingfisher Club by Genevieve Valentine: This is totally Katherine’s fault. She read it because it has fairy tales and knew I’d like it because it’s set in the 20s. Done. And that’s it! Hopefully I don’t come back in two months with even more books! I know it’s a day early, but check out MizB’s ‘Friday Finds’ for more posts like this one. Thanks to MizB’s WWW, I’ve been motivated to power through some books! Currently reading: I’m slowly continuing The Orphan Master’s Son by Adam Johnson. Still not sure if I’ll finish it before it’s due, but I’m at 70% now and making decent progress forward. I finished the next section of The Maze Runner by James Dashner so no new progress there. On audiobook I started Fast Food Nation by Eric Schlosser. I’ve been told it will make me never eat fast food again. Yay? My carpool buddy is back so we’re still working on Brave New World by Aldous Huxley. I started a new book last night; A Hologram for the King by Dave Eggers. I enjoyed the other Eggers book I read and this one sounds really interesting. It’s for my book club that doesn’t meet again until August so I’ll have some time to take it leisurely. Recently finished: Two! I finished two! The Sandcastle Girls by Chris Bohjalian was an audiobook and I really enjoyed it. I met Bohjalian a few weeks ago and found him inspiring. I’m glad I got to read this gem so soon. I also just finished O, Africa! by Andrew Lewis Conn which was an ARC I won on First Reads. I wasn’t a huge fan, to be honest, but enjoyed the setting. I’ll work on a review in the next week or so. Also, I posted a review for The Language of Flowers which I’m sure will have a Book Club Reflection coming soon! Reading Next: I have one more ARC on my shelf to clear off which is The Coward by Kyle R Bullock. Kyle contacted me on my Facebook Fan Page and I’m so honored that he was the first to do so! I’ll be glad to get his book read this summer. I’m hoping there will be some progress next week, too! What are your three Ws? Leave a comment and let me know and check out the original post on MizB’s blog! Book Review: The Language of Flowers by Vanessa Diffenbaugh (3/5). Talk about a narrator that’s hard to like. When one of the ladies in my book club recommended this to me, I was a bit hesitant but added it to my list anyway. When I saw it for 75% at a B&N closing sale, I had to pick it up. And then when the other bookie girls at work were looking for a book to read together, I volunteered my copy and they picked it. I’m glad I listened to that recommendation even though I was hesitant at first. Victoria is about to age out of the foster care system and frankly she couldn’t care less. She’s only ever loved two things in her whole life: Elizabeth and flowers. Since she lost Elizabeth, she clings to flowers as tightly as possible. Elizabeth taught Victoria that there is a language of flowers and that people can communicate with the flowers emotions as specific as misanthropy and secret love. Victoria finds herself a job in a flower shop to pay rent and be close to the flowers she loves. Her natural talent finds her in the flower market where she sees someone from her past who will profoundly change her. And now the spoilers. The story bounces back and forth between Victoria at 18 and Victoria at 11 when she lived with Elizabeth. The story’s unwind simultaneously and we discover that Elizabeth almost adopted Victoria but didn’t feel she could give her the family that a child ‘should’ have. Elizabeth wants to reconcile with her sister, Catherine, and nephew, Grant, to give Victoria a family, but Catherine’s illness makes this impossible. Elizabeth feels at a loss and Victoria feels rejected. In rage, she burns Elizabeth’s vineyard and claims abuse. In modern-day, Victoria meets Grant who has continued to live in the language of flowers and growing the blooms on Catherine’s farm. The two connect over their shared past and become lovers quickly, but when Victoria discovers that she’s pregnant, she’s not sure she can face raising a family or spending her life with one person. I was hesitant at first, but I enjoyed the book more as it went on, though I was disappointed by the ending. Thus the 3/5 rating. Victoria is very unmotivated and very misanthropic at the beginning when she shuts out the only person that’s ever taken care of her. When she’s offered help, she turns away from it preferring to rough it on her own. She grows to be a small part of a family eventually and becomes more likable. I thought the ending was too happy. For such a down book, it had a very upbeat ‘the world is smiles and rainbows’ ending. I didn’t buy it. I’ve never intimately known someone who is a product of the foster system, so I’m not a good judge of how accurate Diffenbaugh’s portrayal of Victoria is. Diffenbaugh herself is a foster parent and I trust her judgement that Victoria is an accurate portrayal. My coworker and I started discussing the book a bit and she was expecting the book to mention sexual abuse at the hands of foster parents but Diffenbaugh stuck to verbal and physical abuse. Grant was by far my favorite character. He was so loving toward Victoria even when she pushed him away. He loved his mother, too, in his own way while she was alive. He came off as such a good person, it was hard not to like him! It was hard for me to relate to Victoria but I could find myself relating to Elizabeth. She wanted someone to love who would love her back unconditionally and I think that’s something a lot of people look for. I’ve known for a long time that I eventually wanted to get married so when I dated, I was looking for someone to love me back unconditionally and I’m lucky that I found him early in life. Unfortunately, Elizabeth took it a bit too far and wanted to develop a traditional family when one wasn’t needed, but I think her heart was in the right place. I liked the flashback scenes to Victoria’s time with Elizabeth. It gave a really good background into her character and helped explain why she was acting the way she did in the present part of the book. I liked that the author told that story slowly because it kept me engrossed in the book and wanting to know more! As I said above, the ending was really disappointing to me. Victoria’s story was so much about loss and abandonment that it felt wrong for it to have a happy ending. I felt it would have been more appropriate for her to have either Grant or the baby, but both seemed like a stretch. I don’t think her character was ready to handle both relationships and I think she would have snapped. Overall, the book was about forgiveness. Elizabeth had forgiven Katherine but Katherine couldn’t forgive. Elizabeth forgave Victoria but Victoria couldn’t forgive her. Katherine’s loneliness killed her while Victoria was able to reconcile with Grant, her baby, and Elizabeth and have a happy ending. I don’t like how it was told, exactly, but it works. Writer’s Takeaway: I loved how Diffenbaugh used the language of flowers to give the story guidance. The subject kept coming up in so many parts of the book and affected so many of the characters in different ways. It helped Renata’s customers find happiness, it helped Victoria establish a successful business. It helped Grant connect with Elizabeth. I loved how central it was to the book and that gave it a very ‘real’ feeling to me. Characters should be passionate about something the way I’m passionate about writing or my co-worker is passionate about golf. Victoria had a passion for flowers. I enjoyed the meanings in the names. The daughter’s name Victoria who lost herself in a Victorian language of flowers. Grant even names their daughter after a flower (Hazel). It was subtle, but I enjoyed it nonetheless. Slow start and slow end, but I enjoyed the middle. Three out of Five stars. Like this review? How about ‘Likeing’ it on Goodreads?